A medieval ring said to have belonged to Joan of Arc, the French heroine who fought the English during the 15th Century, has returned to France after nearly 600 years in England. The ring was bought by the Puy du Fou foundation, which runs a historical theme park in France, at auction in London for $425,000 (£300,000). Joan gave it to an English cardinal before she was burned at the stake. Image caption The inscription reads "Jesus and Mary"
The French heroine is thought to have handed the ring to England's Cardinal Henry Beaufort on the eve of her execution in 1431. It remained in England ever since, and there is thorough documentation to establish its provenance. On Friday it was flown back to France. Puy du Fou president Nicolas de Villiers told French TV it was a "glorious return" for a "French treasure". The foundation appealed to donors to help it bid enough for the ring, which will be officially unveiled this month. The Puy du Fou foundation runs a historical theme park near Nantes in western France that attracts about two million visitors a year. 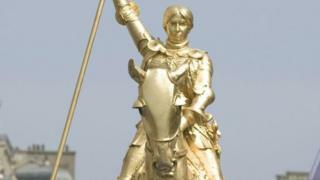 A teenage peasant girl-turned-war commander, Joan of Arc did her utmost to defeat English forces who had invaded France. She advised the heir to the French throne and even led forces in war from 1429 until 1431, when she was captured. The young heroine was then burned at the stake as a heretic and sorcerer by the English. Made in about 1400, the silver gilt devotional ring bears the inscription 'IHS' and 'MAR' for Jesus and Mary. 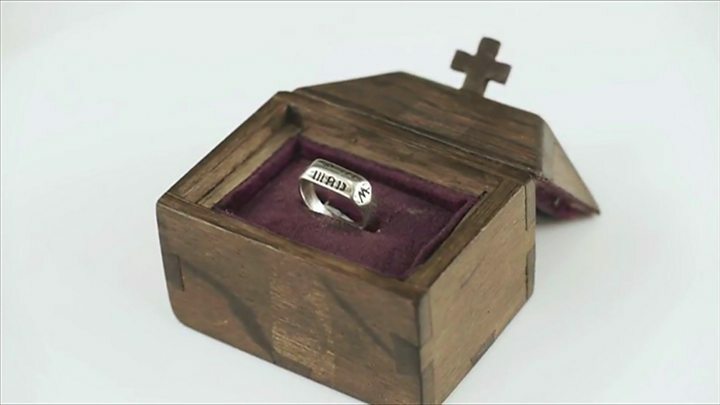 It matches the description Joan gave at her trial of the ring given to her by her parents and its connection to Joan has been documented for more than a century. The ring was offered for sale by the son of James Hasson, a French doctor who came to the UK with General de Gaulle in World War Two, Timeline Auctions said. The doctor himself had bought the ring at auction in 1947 for £175. The auctioneer initially estimated its value at between £10,000 and £14,000 ($14,000 and $20,000) - but it sold for almost 30 times that amount.